The following drill comes from Smedley’s Soccer Site. Eight players are stationed on the outside of the circle, and two players start on the inside. One of the inside players is designated as the target man (T) and the other is designated as the support player (S). The drill begins with a pass in to the target man from one of the outside players. The target plays the ball back to the support player, and the support player passes to any of the players on the outside. From there, the ball is played right back in to the target man to begin the next combination. Play continues for 30 seconds before the two inside players switch out. Speed of play – Use one touch when you can and two touches when you should. 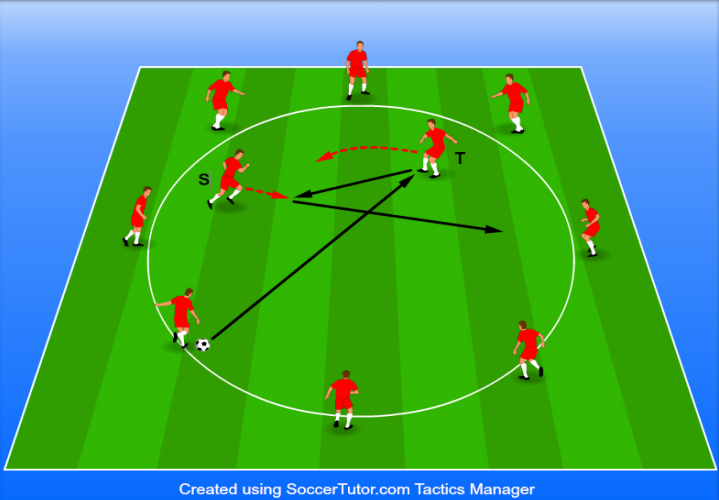 Movement – The target man needs to run away from the player receiving on the outside. Anticipation - Read the play as opposed to reacting to the play. Start your runs early. Progression: Limit the target and the support player to one touch. Get more like this at Smedley’s Soccer Site.